When a child needs surgery, the whole family has concerns. Our approach to surgery for our youngest patients involves making everyone feel comfortable — kids as well as grown-ups. With the Hand-In-Hand approach, preparation for your child's surgery begins upon check-in at The Children's Place, our pediatric center, which is a friendly hospital setting designed just for kids. 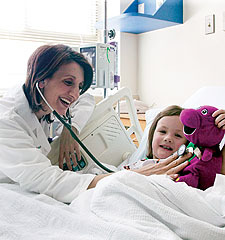 Questions are answered by the pediatric nursing staff and you and your child are led together to the surgical unit. Many pediatric procedures are done in an operating room lined with playful murals to add a level of comfort. As your child's parent or guardian, you may go with your child into the operating room until they are ready to begin surgery. Your face will be the last one they see before "going to sleep". You are welcome to wait in our waiting area so that we may keep you informed of your child's progress. The surgeon will speak with you immediately following the surgery and one of our RN's will bring you into the recovery room to be with your loved one. Lowell General has full-time Pediatric Hospitalists on staff who serve as a connection to other specialists and work closely with a child's pediatrician or family physician to coordinate treatment. Our expanded partnership with The Floating Hospital for Children at Tufts Medical Center provides parents peace of mind with a board-certified pediatrician available 24/7 to deliver highly individualized care through our Pediatric Hospitalist program. For pediatric surgical patients, our in-house anesthesia team includes pediatric anesthesiologists. He or she will meet your child before the surgery and are with them throughout the procedure, ensuring the safety and effectiveness of general anesthesia for children. Most of our surgical specialists perform surgery for children as well as adults. Scheduling an elective procedure means that there is time to help prepare your child psychologically. 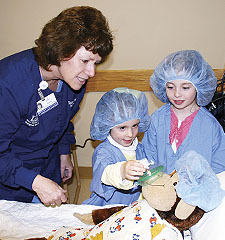 With the help of the pediatric surgical nurses at Lowell General, Surgi-Sam a stuffed monkey, teaches children about the surgical experience in a manner that is non-threatening and understandable from a child's perspective. Participation in this program helps reduce your child's fear of the unknown by providing a better understanding of what he or she will experience as a patient. This makes the surgery process easier for the child and less stressful for the family, too.